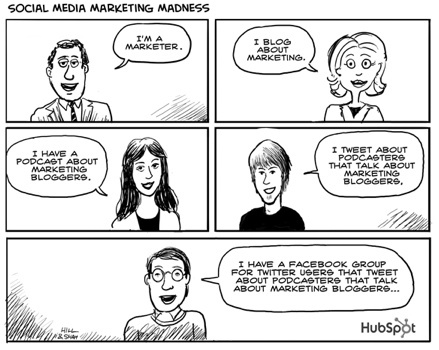 You know you are a social media expert if…. You can rattle off 5 social networks with out stuttering… those are social networks, right? You’re learned how to create multiple social profiles, have them all linked together and post the same message to all of them at the same time, every time. A website is optional in your social media strategy, you have Facebook, right? Who needs a website then. Social media is constantly changing and there is always going to be something new. Just because it is new, doesn’t mean its going to work either. Its fine to jump on the bandwagon and learn a new social network but to promote it too early wouldn’t be fair to whoever ends up using it thinking its going to be effective. There is a lot of wasted time in social media because people are either on the wrong social network, promoting to the wrong people, or using social media improperly. There isn’t a wrong way with social media, a strategy may work for someone, but it doesn’t mean it will work for everyone. There are a lot of best practices you can find online but take everything you see or hear with a grain of salt. You need to test and prove everything for yourself with your situation, product, industry, etc. A social media expert is a really hard title to hang your hat on. I feel I know a TON about social media, and have been referred to as a social media expert at times but I feel I’m more of a social media enthusiast over anything else. I do join all the latest and greatest social networks when I can, I do try to participate and everything else. With my new role at Upright, I’m slightly removed from the day to day need of keeping up like I used to, but I still do it because its a passion. You can tell when someone really knows their stuff by digging deeper past the buzz words and the facade that people put on. Shoemoney and Sullivan Got Me Thinking…. I read Shoemoney’s post within this last week and I honesty didn’t get into the debate about 95% of SEO’s being “the used car salesmen” of search engine marketing (SEM). But then yesterday his podcast with Danny Sullivan about 95% of SEO’s being “shady” and it really got me thinking about the real definition of an SEO and what their value should be. Ultimately Danny and Shoe made really good point, and I understand Shoe position. What value do we truly offer as SEO’s or SEM’s? Danny talked a lot about new things coming in and kind of branching off SEO like reputation management, social media, etc. and I think they are viable SEO activities but at the same time, I feel they shouldn’t be used to “razzle and dazzle” but rather compliment the basics such as the title tags, building out content, and link building. The more and more I learn about SEO, true link building is an art and not such an easy one. I mean, people are building out great content and getting links back, but I think there are some elements to link building that can be tougher than just content creation. I think this podcast was awesome and more real discussions like this should take place between people in the industry! Thanks Shoe and Danny! Posted on January 24, 2008 Categories SEM, SEOTags Link Building, SEM, SEO, Social MediaLeave a comment on Shoemoney and Sullivan Got Me Thinking….